MORE THAN a year after President Rodrigo R. Duterte signed the Freedom of Information executive order, a practice completely reverse of the policy has been creeping onto some documents requested by the public. The likely tool for the unexpected move: a black marker. Redactions on items declared by Cabinet officials in their Statements of Assets, Liabilities, and Net Worth (SALN) released by the Malacañang Records Office have recently been noted by media outfits requesting these as material for stories. More importantly, the redacted details included some of the most crucial ones – and at the very heart of the reason why public officials were required by law to file the integrity document in the first place. The intense redaction was done on the SALNs of current and former Cabinet members that were filed as of December 31, 2016, or earlier this year for those appointed in their offices more recently. On these redacted SALNs, details regarding real and personal properties, asset values, business interests, and liabilities were blacked out, most probably with a marker. The practice – which can only be described as a deviation from the FOI EO’s push for transparency – is apparently new. Some Cabinet officials had filed SALNs earlier as of June 30, 2016, or upon assumption into office, and these came without any redactions. Neither do pre-2016 SALNs of the same individuals. Their December 2016, as well as of those more recently appointed to their current offices, bore significant redactions, however. Among the 29 SALNs reviewed by PCIJ, there was a total of 167 redacted details, the entries replaced by long, black, and blotchy rectangles. Twenty-eight of the SALNs had the acquisition costs or amounts of personal properties blacked out while in 24 the exact locations of real properties were redacted; 23 SALNs had blacked-out acquisition costs of real properties as well. But redactions on details regarding real properties and business interests of some of the officials took a turn for the ridiculous, with only the cities or provinces left readable out of the addresses. For instance, the redaction done on the details on one of Communications Secretary Martin Andanar’s real estate holdings left only “Mindanao” as its location. The specific value of each item declared in real properties, personal properties, and liabilities was also redacted in all the 29 SALNs reviewed. Only the total value of the items under each of these categories was left untouched. 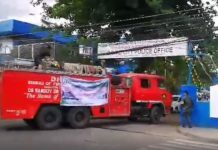 Andanar – an early supporter of the FOI executive order – emerged as having the most types of detail redacted on his SALN: 10, namely Filer’s Address; Spouse’s Office Address; Name, Date of Birth, and Age of Unmarried Minor Children; Description of Real Properties; Exact Location of Real Properties; Acquisition Costs of Real Properties; Acquisition Costs/Amounts of Personal Properties; Outstanding Balance of Liabilities; Business Address of Business Interests and Financial Connections; and ID No. of Filer and/or Spouse. 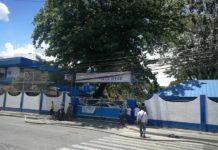 Two of his Cabinet colleagues – Justice Secretary Vitaliano Aguirre II and Health Secretary Paulyn Jean Ubial – meanwhile had nine types of detail redacted. These were blacked out in the SALNs of both Aguirre and Ubial: Filer’s Address; ID No. of Filer and/or Spouse; Acquisition Costs of Real Properties; Acquisition Costs/Amounts of Personal Properties; Exact Location of Real Properties; Outstanding Balance of Liabilities; and Spouse’s Office Address. Redacted in Aguirre’s SALN as well were Business Address of Business Interests and Financial Connections and Description of Real Properties. In Ubial’s these were also blacked out: Name of Creditor and Name, Date of Birth, and Age of Unmarried Minor Children. Eighteen or 60 percent of the SALNs reviewed each had between five and eight types of detail redacted. Agrarian Reform Secretary Rafael Mariano and Tourism Secretary Wanda Teo meanwhile had the least redactions on their SALNs: two each, the Filer’s Address and Amount of Personal Properties. Tally: How Many Redactions in Whose SALNs? *Note: Some pages of the SALNs of Briones, Cayetano, Cimatu, Lopez (Ramon), Lorenzana, Mariano, and Teo were missing from the copies released by the Malacañang Records Office. Interestingly, the President’s own December 31, 2016 SALN has even less redactions than Mariano and Teo. Released by the Office of the Ombudsman, Duterte’s address is the only portion blacked out by the repository agency. His four-page SALN declaration also did not shy away from providing details, with the addresses of his real properties complete up to the lot and block number. Of late, though, the redaction frenzy seems to have calmed down somewhat. The bad news is that it looks like the items to be redacted in released copies of SALNs to the public are now being set and made part of the process. On September 18, the Malacañang Records Office (MRO) released to PCIJ a fresh batch of SALNs, among which were those of Cabinet members and other high-ranking officials. The batch included the latest SALNs on file at the repository agency and was made up of a total of 46 SALNs filed by some 45 appointed officials, some of whom are still in office, while a few others have already resigned or have been removed. Department of National Defense Undersecretary Eduardo D. Del Rosario had two of his SALNs in the pile, one as of July 1, 2016 and the other as of Dec. 31, 2016. Redactions in this batch were kept within a five-item list: Filer’s Address; Name, Date of Birth, and Age of Unmarried Minor Children; Exact Location of Real Properties; ID No. of Filer and/or Spouse; and Signature of Declarant and/or Spouse. All 46 SALNs had redacted Filer’s Address and Signature of Declarant and/or Spouse. Blacking out of the declarant’s and their spouse’s signatures were made on all pages, as some filers signed each page of their SALN. Seven out of the 46 SALNs have five redacted details, 28 or 60 percent of the total have four redacted details, and 11 have three redacted details. Tally 2: How Many Redactions in Whose SALNs in the New Batch? The five-detail redaction checklist also applied to SALNs of Government-Owned and Controlled Corporations that were released on Sept. 18 as well. 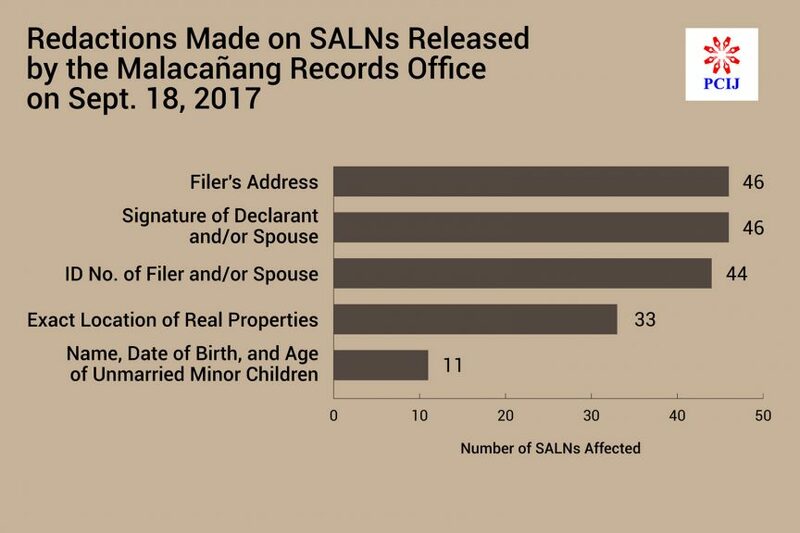 A total of 65 SALNs of Duterte GOCC appointees had blacked-out Filer’s Address, Name, Date of Birth, and Age of Unmarried Minor Children; Exact Location of Real Properties; ID No. of Filer and/or Spouse; and Signature of Declarant and/or Spouse. And yet SALNs of Duterte-appointed GOCC appointees – also recently released by the Civil Service Commission (CSC) — did not bear any kind of redactions. In fact, each page even had a “Certified True Copy” stamp of CSC’s Communications Management Division. Aside from the issue of redaction, though, PCIJ observed a few blunders in the filed SALNs of the listed high-ranking appointed officials. For one, Transportation Secretary Arthur Tugade used outdated SALN forms in his recent filings. For both his June 30, 2016 and December 31, 2016 SALN declarations, Tugade used the SALN form mandated by Civil Service Commission Resolution No. 1100902, promulgated on July 8, 2011. CSC, however, declared through its Resolution No. 1500088, promulgated on Jan. 23, 2015, that a revised SALN form be used from then on. The older form also cited both the Republic Act No. 3019 or the Anti-Graft and Corrupt Practices Act and Republic Act No. 6713 or the Code of Conduct and Ethical Standards for Public Officials and Employees on its header. The newer form, meanwhile, only cited the latter. Presidential Adviser on the Peace Process Jesus Dureza, meanwhile, indicated “Cabinet Secretary, Office of the President of the Philippines” for his position and office instead of his more specific role. Also, it can be confused with the role of Leoncio Evasco, Jr., which is currently the Cabinet Secretary, according to the Office of the President website. 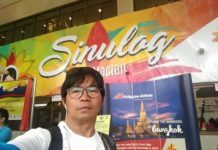 Former National Irrigation Administration (NIA) chief Peter Laviña also failed to indicate his post as of December 31, 2016 when he filed a joint SALN with his wife for the end of 2016. The Laviñas filed their December 2016 SALN on April 26, 2017, or almost two months after Peter Laviña resigned from NIA.